Focussing on some more obscure brands and a couple of old favourites, this month's guide will definitely give you some ideas for Spring. The UA Alter Ego tops got a mention last month however they have been given a refresh ahead of the release of the Avengers Movie out in the US on May 1. These new tops have a more hand drawn illustrative quality to them with even more detail so you can feel like you are the hulk at the gym, not a bad thing! Anyone who wants to make body suits for men acceptable in the Gym gets a vote from me and these suits look awesome. 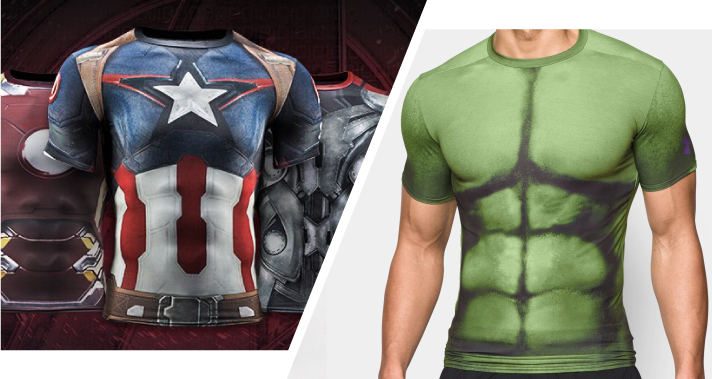 The brand covers both gym-wear and more adventurous cosplay type gear. It’s pretty expensive stuff but the company makes each suit to order and seem to adjust them for you if there’s a problem with fit. Even better, the suit above is on sale right now and comes in 6 color options. I can I will started in 2012 and aims to inspire people to achieve their fitness goals. That’s all very well, but what’s the gear like? 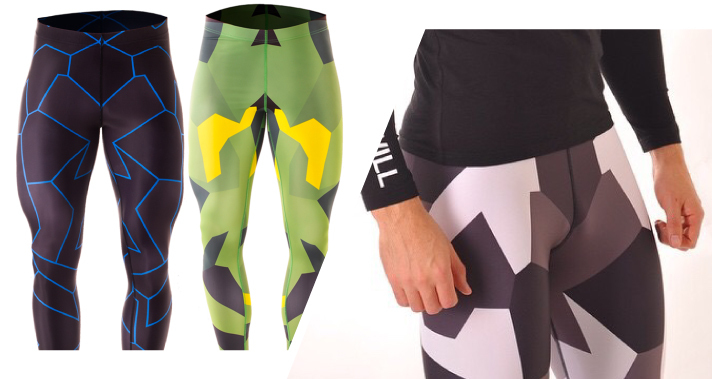 Well I love these tights with a kind of dazzle-camouflage styling and the black-blue Tron pair gets my vote too. At a similar price point to Nike gear I’m definitely going to give them a go. If you have worn every crazy thing you can think of to a club and you have a proclivity towards glow sticks, then a pair of these incredible tights are for you. With just the right amount of sheer without looking like a lady and the shaping-strips around the crotch to keep your junk in place while you werk it on the podium, these tights are the pinnacle of ridiculous-amazing. Let us know your favourite gear and I'll be bringing you another roundup with the best of what the summer's got to offer soon.